On Thursday night, Democrats beat Republicans by a score of 11-2 in an annual charity baseball game. And if this were normal political reporting, that would be the only thing that mattered. Scoreboard, scoreboard, scoreboard. Who are these jerks, anyway? Because it’s simple for the media to report basic facts: polls, standings, vote counts. But think about your life– is there a series of metrics or key performance indicators that can truly reflect your life, your work, your relationships, or the things that really matter? And yet that is how most of us view Congress– through the endless fascination with the scoreboard. Herein, in my inaugural article (I promise I’ll start talking about movies, comics, and TV soon), I want to talk about baseball, I want to talk about partisanship and the twin-headed dragon that brought us here, and also how, of all things, Looney Tunes offers us a way forward– past just scoreboard, scoreboard, scoreboard. Decrying “partisanship” is not new– it was well documented in numerous academic articles and journalistic exposes, including Washington Post’s Juliet Eilperin in her 2007 book Fight Club Politics: How Partisanship Is Poisoning the House of Representatives, where she noted Democrats and Republicans don’t even go to the same cocktail parties any more. People long for the days when Speaker Tip O’Neill and President Ronald Reagan would get together for drinks. Bipartisanship seems the cause celebre of every would-be “centrist” “thought leader” inside the DC bubble who claims that both sides are equally as fault and if only everyone was just “nice” to each other, things would be ok. This is not that article. Because it not only views relatively recent history through rose-colored glasses, but also paints an unrealistic expectation of what we want and what we desire. Responding to his father being namechecked by both Mitt Romney and Barack Obama in the 2012 debates, Tip O’Neill’s son pointed out the many ways his father fought Reagan and his agenda tooth and nail. So, what changed? Did we change? Have we gotten meaner? Who started this slide towards more partisanship? Rather than cast blame immediately (duh, everyone knows it’s the Republicans’ fault!) I’d rather talk about systemic issues that poison the environment for everyone, making a charity baseball game the rarity rather than the norm. Those two systemic issues are money and gerrymandering. The amount of money flowing into our elections has exploded. The cost of Congressional Elections has nearly doubled since the 1990s, and had its largest jump between the 2008 and 2010 election cycles. What happened then? Citizens United v FEC, of course. And it’s worth noting we don’t even know how much money has been spent by SuperPACs since then, as none of that spending has to be disclosed. The average member of Congress spends far more time in their work week dialing for dollars and less time actually governing– with the parties demanding they spend 30 hours a week dialing for dollars and being told to raise ridiculous sums like $18,000 dollars per day. And, of course, who gives money and what motivates donors? Stories of bipartisan cooperation? Or shows of bravado and signalling your opposition to the other side? If your issue is (abortion, taxes, health care), you will not be motivated to help someone who is “selling out” to, cooperating with the other side– you will fund a filibusterer if it prevents your most hated bill from becoming law. This creates and reinforces the in-group/out-group dynamic that turns political parties into merely the teams wearing the other jersey. And so these issues, since they are systemic, exist in both parties. But, rather than fall trap to the fallacy that since both sides have the problem they are both equally at fault, let’s be very clear that the overwhelming beneficiaries of more money and more gerrymandering have been Republicans. And very few of them, and none in their leadership, are working on campaign finance reform or redistricting reform. Indeed, many are flatly opposed. By removing Big Money and Gerrymandering from the system, we can remove at least some of the systemic issues that keep Republicans and Democrats from working together. But I mentioned Looney Tunes, and that’s where I’m going to end. Sam the Sheepdog and Ralph the Wolf are two slightly less-well-known characters from the Chuck Jones classic era, and folks will notice the similarities between Ralph and Wile Coyote. But the key conceit of these cartoons is that Sam and Ralph live together, are friends, and then punch the clock and are immediately working at cross-purposes– usually to inflict violence upon the other. It is definitely naive to think our politics can be this way. But it’s a nice dream. I’m not saying it’s possible, I’m saying it is worth striving for and far superior to our present situation. I don’t want our politics to be some mealy-mouthed wishy-washy bland amalgam of discourse, any moreso than I would want to go to a baseball game to see weak hitting, poor pitching, and incompetent fielding. Give me the best– a real challenge of wills with everyone bringing their best. I want grand debates about real issues, and the best ideas clashing against the best issues. I want Republicans and Democrats at each others’ rhetorical throats reminiscent of other great debates among great thinkers in our past. But I don’t want them to hate each other. I don’t want us to hate each other. And this week– hell, these last six months several years– we’ve seen what happens when we allow infantile debate and personal vitriol to replace grand ideas. We should be Sam the Sheepdog and Ralph the Wolf– and when the workday is over, we punch the clock and go have a drink together. We should be the Yankees and the Red Sox during a tight pennant race. We should try to overcome those things that divide us so a single yearly baseball game isn’t the only highlight members of Congress look forward to where they forge real relationships among political rivals. The juggernaut that is Batkid isn’t done yet. Batkid rides again, this time at the San Francisco Giants‘ home opener to help throw out the first pitch. He even roles up with his own Batmobile. And here’s the video of him throwing out the first pitch. This Wednesday, August 7, the San Francisco Giants take on the Milwaukee Brewers and present the Stan Lee Experience in the Triples Alley Premium Space at AT&T Park! 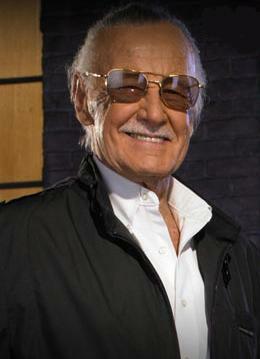 Stan Lee, the genius behind the Marvel empire, will be on-hand at this exclusive VIP pre-game party! All VIP Special Event ticket holders will get to enjoy complimentary food and beverage (including beer and wine), and will receive a limited-edition Giants themed art print, inspired by the legend himself, Stan Lee. Each piece is signed by both Stan Lee and Sergio Romo! Unlike any other ballpark setting, this on-field space is the perfect place to enjoy all of the pre-game excitement at the ballpark. Triples Alley, the Giants newest premium location, has it all, including on-field access from which to watch batting practice, early access to the ballpark, and at the conclusion of the pre-game event, a walk along the warning track on the field to get to your seats for the game. Whether you already have a game ticket or not, you can participate in the VIP Special Event! If you do not have a game ticket, you can purchase the “Full Package”, which includes full access to the Triples Alley pre-game party space, as well as a Lower Box ticket. If you already have a ticket to the Wednesday, 8/7 game, you can purchase the “Add-On” option, which includes full access to the Triples Alley pre-game party space. Please Note: in order to purchase the “Add-On” option and attend the VIP event, you must have a valid game ticket, as well. The Giants website says this is sold out, but you never know the day of the game or maybe you can find tickets online. On Friday, Stan Lee threw out the first pitch before the Washington Nationals took on the Philadelphia Phillies. The game was rain delayed during the first inning for over 2 hours. The Nationals went on to come from behind and beat the Phillies 8-4 after a home run by Ryan Zimmerman. Hope I’ll be able to reach the catcher when I toss the ball. Is it okay to roll it? But the appearance isn’t tied to the weekend’s convention, just a 45 minute drive north from Washington, DC. Instead it’s to kick off the East coast literacy campaign for the Stan Lee Foundation. The foundation is teaming up with local comic book shops to donate comic books to the areas kids. The foundation’s goal is to help fight illiteracy in children, something comic books are playing a big part in more and more. As one who has dealt with reading and writing all my life, I wish every young person could experience the satisfaction that comes with the ability to read, enjoy and benefit from the written word. So, who wants to go see a comic book legend throw out a baseball?